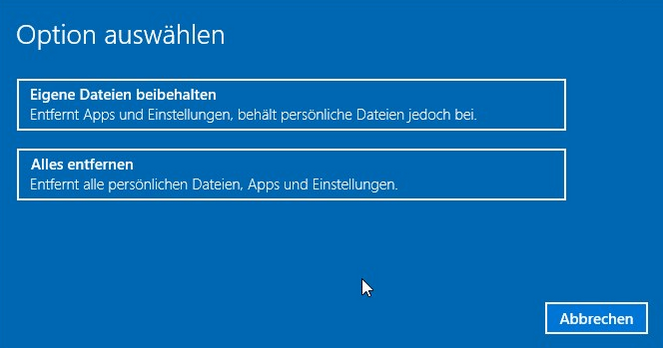 ONE.de Service-Center - How can i reset my Windows 10? In order to quickly and easily restore your Windows to the default settings, we have set up a recovery partition on your ONE PC system, Notebook or Xcellent Tablet. You can start the recovery process directly from the running Windows. - Press the "Windows + I" buttons simultaneously. - Now open the WIndows settings, select the "Update and Security" entry. - In the next window, click "Restore" on the left side. - Click the button "Reset this PC". An option windows opens, where you can choose between "keep my files" and "remove all". Decide on a variant and select it. Depending on wheter you are logged in with a local account or Microsoft account, some items (such as apps) are synchronized the next time you sign in. If your device does not start into Windows, you can use the instructions for a complete reinstallation of Windows 10. How can i create an Windows 10 Image? How can I find out the BIOS and Firmware version? Where can I find my Windows 10 disk? Why do my USB devices not working with Windows 7?